Please, answer this question now before reading any further. Don’t think about it, be spontaneous with your answer; accept the first color that comes into your mind and don’t analyze your choice. Color: The effect produced on the eye and its associated nerves by light waves of different wavelength or frequency. Light transmitted from an object to the eye stimulates the different color cones of the retina, thus making possible perception of various colors in the object. Like death and taxes, there is no escaping color. It is ubiquitous. Yet, what does it all mean? Why are people more relaxed in green rooms? Why do weightlifters do their best in blue gyms? I have wondered even why do I tend to use a blue ink or font when writing? It is our instinctual choice of a color that tells us a lot about who we are; how we function and how others see us? It can be yet another means to understanding our behavior and our personal traits; as well as our mental, emotional, spiritual, & even our physical states. It can be reflective of the way we choose to navigate in the world. Color can help guide us through our strengths and weaknesses, through our vulnerabilities, and through all our challenges we experience. Most all of us choose what the industry refers to as Personality Colors. Our personality color do not have to be one(s) that we wear all the time; but it is usually our favorite, the color that excites us the most, and makes us feel alive when we see it. That being said, we are often drawn to our personality color for clothing and home decorating. It is often a predominant color in our aura. It is also the color that when our family & close friends think of us, or when asked what our favorite color is they are likely to instinctively know. So, ask loved ones what your favorite color is…..
What they share with you could be telling. Does everyone have a favorite color? Many of us do have a favorable color, and most of us have had the same one since childhood. Or maybe a variance in hue or tint. Some of us may change our color favorites one or more times during our life, while others will have one color for their whole lifetime. Some us will prefer another color for a while, depending on our needs & moods at that time. Yet we are likely to come back to our original favorite when those specific needs are met. When the color has served its purpose. If you are someone who doesn’t think you have a personality color, could you maybe reconsider? Take a meander into your clothes closet/cupboard where you store you clothes you wear regularly. Peek around your home or office, reflect on the way you choose to decorate. See color? Of course you do. Is there one, or are there more colors you consistently choose? For my home, it has been a combo of forest green and a rich shade of maroon, yet I tend to wear blues, and earth-tones. I throw in some purple for sassy days. These choices will be the colors that reflect our personality, and our deepest needs & desires. Whether we like or dislike a color can be dependent on our own life experiences; our positive and negative associations to “our favorite color” as well as our need for the qualities of that color. The colors that we dislike are as telling about ourselves as the choices we like, most often reflecting where our weaknesses and vulnerabilities lie. Our most disliked color could likely to relate to areas in our life that need to be given some attention; or past hurts that need to be healed. If we feel a visceral dislike to a color there is likely a reason. It can be helpful and a good idea to try to incorporate a small amount of the disliked colors into our life by using small amounts of the color in clothing, or in your home to help balance our energies. I have found for me rejecting whole color choices creates an imbalance in my life something I am uncomfortable with. But what if we are color blind? It doesn’t mean a person who is color blind can’t see any color at all, like a black and white movie. It does however mean having trouble seeing the difference between certain colors. Being color blind can make it tricky to match your shirt and pants, but it’ s not a serious problem. People who are color blind can do normal stuff, even drive. Most color blind people can’t tell the difference between red or green, but they can learn to respond to the way the traffic signal lights up — because the red light is generally on top and green is on the bottom. 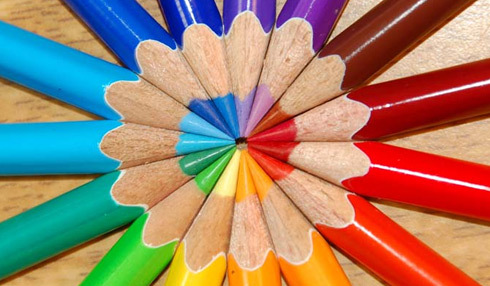 What does your (favorite) personality color say about you? While you may not exhibit all the character traits of your personality color, you will find yourself somewhere in the descriptions I believe. You may also find you might exhibit some of the negative traits, particularly when you are stressed. If you have two equally favorite colors, read the information on both to fully understand yourself and what motivates you. If green is your favorite, you have a deep need to belong, to love and be loved, and to feel safe and secure. You need acceptance and acknowledgment for the everyday things you do for others – just a ‘thank you’ is sufficient. If purple or violet is your favorite color, you have a deep need for emotional security and to create order and perfection in all areas of your life, including your spiritual life. You also have a deep need to create and participate in humanitarian projects, helping others in need. Finally, have you changed your favorite color? If you have changed your personality color, try to identify the circumstances surrounding your life at that time as your new favorite will reflect qualities you need to attract into your life to help you navigate and process any new circumstances. I prefer to make a practice out of surrounding myself with the colors I love, either by wearing them, or using them decoratively in my environment. The color choices I make empower me to be true to myself. It is the perfect expression of showing my true-colors, wouldn’t you say? What does any a particular pattern or motif we keep in our home or wear say about us? For instance I have a plethora of roses and elephants. The last of the hand-made cards I created in the month of September. Working with my hands to create a piece that may give another pleasure works to keep me on an even keep most of the time. It’s an emotional release creating art. It is also so meditative with music to sing to, and hands to create with, I am certainly blessed. The sentiment on this card says “Hello” I am not sure why it is reversed I have never had this happen an did nothing different in the taking the photo, cropping it, and uploading it here at WP. Fall cool weather has finally hit the high desert in Central Oregon. I am grateful to smell the cool dry air that we have here. Now the watch for snow begins, creatively I have moved on to Halloween and Thanksgiving/Gratitude cards. I love the color palette I am working with this time of year.The earth tones with tints of bronze and golds speaks to my heart. This time of year is also my favorite – for the textures and colors in nature are like no other time of the year. I even like the raking of the Fall leaves into piles. I will invite the neighbor hood children for a dip.